Two-time Formula One champ Fernando Alonso emerges as top contender. INDIANAPOLIS — One of IndyCar’s all-time greats will lead the field to green at the Indianapolis 500. All eyes, though, will be one row behind Scott Dixon as Fernando Alonso makes his debut in “The Greatest Spectacle in Racing.” Alonso has never raced on an oval before, never raced an Indy car and hasn’t done a rolling start in 20 years – and that was in a go-kart. So, yeah, Alonso lingered long after all the other competitors in the final driver meeting before Sunday’s race. The two-time Formula One champion peppered race director Brian Barnhart with questions for a solid 15 minutes before riding off through Gasoline Alley on his skateboard . He’s as ready as he can possibly be, and ranked fifth — the fastest rookie _ on the speed chart during the final day of practice. 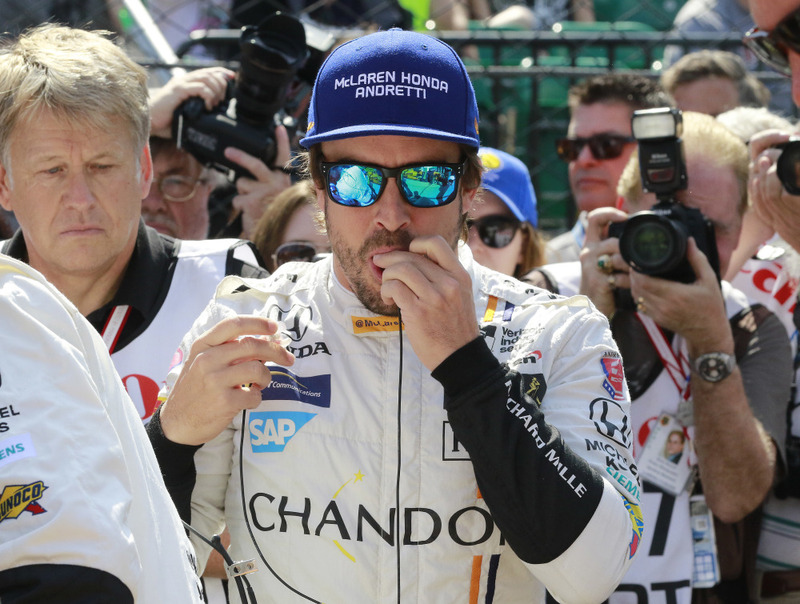 Alonso has enjoyed every minute at Indy , but he’s not letting the hype around his quest to win racing’s version of the Triple Crown – he’s already won at Monaco in F1 and would like to someday run Le Mans _ distract him from his mission. That’s the intensity it will take to win the 101st running of the Indy 500. Still, it is Dixon who should be the favorite to win. The New Zealander had the fastest qualifying effort in 21 years to win the pole, and he’d like to drink the victor’s milk for the second time in his career. Dixon won this race in 2008, he’s a four-time series champion and ranks fourth on the all-time win list behind only A.J. Foyt, Mario and Michael Andretti. “In my generation, he’s the best,” said Tony Kanaan, the 2013 winner of the Indy 500 and Dixon’s teammate. It doesn’t hurt that Dixon this year is in a Honda, which has dominated the buildup to Sunday over rival Chevrolet. The Chevy camp – particularly Team Penske – has been dramatically overshadowed so far but finally showed better speed Friday. Three-time Indy 500 winner Helio Castroneves, veteran of the Penske camp, was fastest on Carb Day . Team Penske has four of the top five drivers in the IndyCar standings, has won the last three races of the season, and added two-time 500 winner Juan Pablo Montoya to its lineup for Sunday. Still, a win by a Chevy driver might be considered an upset based on how strong Honda has been. Although reliability on the Honda engines has been spotty – James Hinchcliffe had a failure during Friday’s practice – the speed is there and Honda won last year with Alexander Rossi, a rookie who coasted across the finish line on fumes. Rossi is part of the massive effort from Andretti Autosport, which expanded to six cars when it took on Alonso last month. Most teams might have flinched at taking on such a heavy workload for the biggest race of the year, but the Andretti camp did not back down. There has certainly been a buzz around the Brickyard for Alonso, and worldwide television ratings should get a significant boost Sunday. IndyCar drivers are smart enough to understand that Alonso is good for all of them right now. With no clear favorite, questions about Honda’s reliability, Penske’s power and Alonso’s lack of experience in this race, there could be a surprise winner in a race Roger Penske believes could be even more exciting than last year’s historic 100th running. Kanaan, a driver who had his heart broken repeatedly at Indy before his breakthrough victory four years ago, can’t predict what might happen. “The track is a she, first of all, and she picks the winner,” Kanaan said. “I mean, look how many chances I had, not just me, but good drivers, led races. We can make a list of people who should have won this race, and then all of a sudden something happens.